With a bit of luck the first fine weather will coincide with the low spring tides during February, and the rockpooler will be able to venture down on to the shore for the first time in 1997. Exactly, what he, or she, will find will depend on the weather. Look out for Sea Slugs, the shell-less molluscs called Nudibranchs with some species coming into breed during the early months of the year. The spawn will be laid on the underside of rocks. Take care to return the rocks in exactly the same position as you found them. During February the sea temperature around most of the British Isles will fall to the lowest of the year to about 7oC in the English Channel and as low as 4oC off the northern North Sea coasts of Britain. After the essential water requirements of the correct temperature and sufficient dissolved oxygen have been satisfied the next most important factor to be considered by the aquarist is how is he going to feed the fish and other animals in his aquaria. The responsible marine aquarist cannot rely on putting in proprietary foods and hoping for the best. The native marine aquarist can visit the shore and get a good idea of what feeds on what. He can also collect Mussels, Cockles, Prawns, Shrimps, Mysids and other food items from the intertidal zone to satisfy his captives. Frozen sea food and live Brine Shrimp are also available from the better aquarium retailers. Brine Shrimp and Mysids can be cultured to feed to Pipefishes and young fish that require exclusively live food. Rotifers can also be cultured for plankton eaters, e.g., very young fish, that require this food. Primary production - involves 'autotrophic' organisms like the seaweeds and the microscopic phytoplankton (pastures of the sea) that harness the energy from the sun with water and carbon dioxide to synthesise carbohydrates in the presence of chlorophyll, in the process called 'photosynthesis'. Other mineral salts are also necessary for growth. This stage of production is only rarely possible in the artificial environment of marine aquaria. Secondary production - is the feeding for 'herbivorous' animals on the plant production in the sea which includes the direct consumption of phytoplankton by microscopic organisms called zooplankton, and the filter-feeding molluscs like Mussels that consume vast amounts of diatoms (the commonest type of phytoplankton). Some animals like Periwinkles are grazers of microalgae and seaweeds. Tertiary production - is the next stage in the food chain where the predatory animals feed on the herbivores. These are the animals that are easiest to satisfy in aquaria because they prey on food that is large enough to be collected. In many cases they will also consume dead food, and the opportunistic feeders in this group of predators are the most successful aquarium fish. In the cycle of life and death in the oceans, and in aquaria, one large group of organisms fulfil an important role. 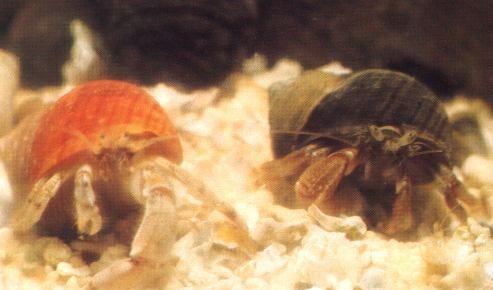 Small Hermit Crabs are sometimes to be found on the shore in the early months of the year. They feed by scavenging both animal and vegetable matter from rock surfaces using their claws, and also filter feed from the surrounding water, collecting plankton and particles with fine cilia. The species on the left is Diogenes pugilator and on the right the commonest species Pagurus bernhardus. These 'heterotrophic' organisms on the microscopic level convert the waste products of fish like the harmful ammonia to less harmful compounds called nitrites. The aerobic Nitrosomonas bacteria fulfil this function in the biological filter bed. These will establish themselves in aquaria with the addition of organic matter. Large animals are also scavengers and animals like Prawns and Hermit Crabs will feed on dead organic matter, pieces of uneaten food, etc. Many fish and invertebrates have a specialist diet and they can prove difficult to feed. In tropical marine aquaria the problem that some fish eat exclusively coral polyps is well known and is one example of fishes that should not be sold unless the aquarist can provide the fish with its natural diet. For rockpoolers who catch their own fish he has to find out for himself what they eat. Luckily, many of the rock pool fish will eat anything that is recognisable as food. This may include the aquarist's fingers, but will rarely include 'flake' food that is gobbled up by Goldfish. Research is paramount. There is very little scope for 'cheating'. Pipefish vacuum up small crustaceans and larvae in their pipe-like mouths. They have been persuaded to recognise frozen Mysids as food, but cannot be relied upon to do so. LEFT: The Grey Sea Slug, Aeolidio papillosa, feeding on the Beadlet Anemone Actinia equina. 'Shorewatch', Glaucus House, 14 Corbyn Crescent, Shoreham-by-Sea, Sussex. BN43 6PQ. 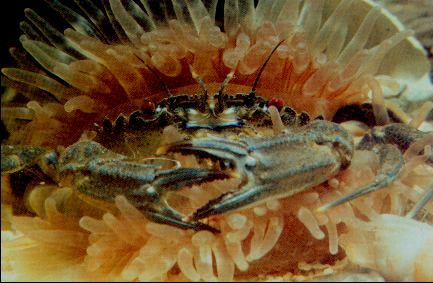 BELOW: Although, it is known that the Dahlia Anemone, Urticina felina, can engulf crabs almost as large as its own bulk, it is not known precisely how this occurs. I would expect a large crab to be sufficiently resistant to the stinging cells in the tentacles to be able to pull itself free, and this is what happened in the photograph. There are regulations forbidding collection from certain areas and at certain times of the year which the rockpooler should be aware of. These apply notably to Periwinkles. Mussels are a good staple diet. The trick is to boil them in their shells and scoop out the rich orange flesh. The Mussel flesh can be frozen. Prawns and Shrimps are best used as live food. It is a common mistake to put too many into the tank as the increased stocking level can cause an oxygen depletion. Limpets can prove too tough even after boiling, and are best used only in an emergency. Tropical aquarists should be warned that introducing live food can introduce disease which can ruin the appearance of expensive coral fish. Winkles are the worse example. The often used statement that fish should be fed as much as they can eat in a few minutes can be misleading. There is no substitute for knowing your fish and their feeding behaviour. Some predatory fish are 'macrophagous' and will eat relatively few large meals. Others like the Pipefish family, including the sea-horses, are 'microphagous' and require frequent and copious quantities of food at least four times a day, and possibly more often. It is likely to be more useful for the aquarist to estimate how much of their body weight each fish will consume every day. My observations indicate a figure of wet food between 5% and 10% for adult fish, with greater amounts for growing juveniles. Watch out, your prize exhibit can easily get eaten by a fish that was smaller when caught, but has grown much more rapidly than its tank companions, which it is stealthily reducing in number. However, it is relative competitiveness of fish that is harder to spot. Aggressive fish may deprive their shyer inmates of their share of the food on offer. Good luck and careful fishkeeping.